Even if you’re getting a lot of Spring rain where you live, we all know that sunny skies will soon follow. Do you have a favorite pair of sunglasses for those sunshiny days? I’m obsessed with sunglasses. I never leave the house without them, even on overcast days, and that includes when I’m walking my dogs. To me, sunglasses are just as important to my overall style as a great pair of shoes or a beautiful piece of jewelry. That’s why today I want to introduce you to Warby Parker and show you some really cool sunglasses for stylish dog moms… and dads! I’ve been a Warby Parker customer for several years because I love their huge selection of amazing sunglasses and regular glasses. There’s a style for everyone, and they even offer a free home try-on option. It’s a fantastic way to make sure you’re going to love the glasses you choose. I’m really excited to show you Warby Parker’s Spring 2017 Collection, Sunscapades! This brand new line features oversized sunglasses for all those larger-than-life adventures with your dog this Spring and Summer! This line includes styles that are perfect for both women and men, and they’re so reasonably priced that you might even choose more than one pair! I personally love having several pairs to choose from, because they complement every outfit as the perfecting finishing touch! 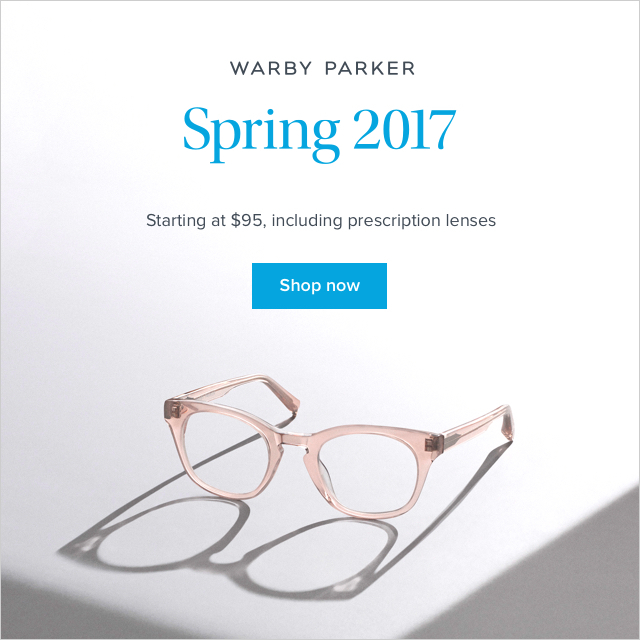 Whether you’re looking for regular eyeglasses or sunglasses, I just know you’ll find something you love at Warby Parker. In fact, I’m so sure you’ll love them that I’m giving away a free pair of WP sunglasses (your choice, up to $95)! To get entered, just follow the easy peasy instructions in the Rafflecopter widget below. Just be sure to get entered to win by next Tuesday, March 28, 2017. The winner will be randomly selected and announced on The Lazy Pit Bull Facebook page next week. Be sure you’re following us there so you don’t miss out! Good luck! I love the brushed ink with gray gradient lens Ivy sunglasses. They would be so nice to wear to the beach and in the car. BANKS for me. I also love DURAND. I like the Laurel in peacock green. I would choose the Ames sunglasses. I love, love, love Warby Parkers. They are incredibly awesome glasses and sunglasses. Check out their mission statement too. I would get the Piper with Woodland Tortoise with Grey Gradient lenses, based on the measurements. The one I most like is the Raglan Pearled Tortoise glasses. I would probably choose the Madison style. I would choose the “Moore” style I think. It’s hard to choose they are all nice! I like the Raglan style in pink! If I won I would pick the Reilly sunglasses. Wow…these are super-cool! I’m such a sunglasses fan! They are pretty awesome, but I do really like the Deep Sea Blue Durand and the Beach Glass Jennings, and the Belize Blue Eastman ones all would look awesome while I’m out walking my Siberian Huskies! I am bookmarking the page. Love them. Thanks for hosting such a great giveaway! I have several I like, such as the Windham style. I hope we can change our minds if we win, cause there are several and I can’t make up my mind right now! I’d pick the Laurel in Peacock green! Those are some beautiful frames. I like the Lionel. I have a soft spot for aviator-style sunglasses. I like the Silvan women’s sunglasses. They are a lovely shade of clear pink. I like the Becket 16. I would chose the barkley sunglasses!